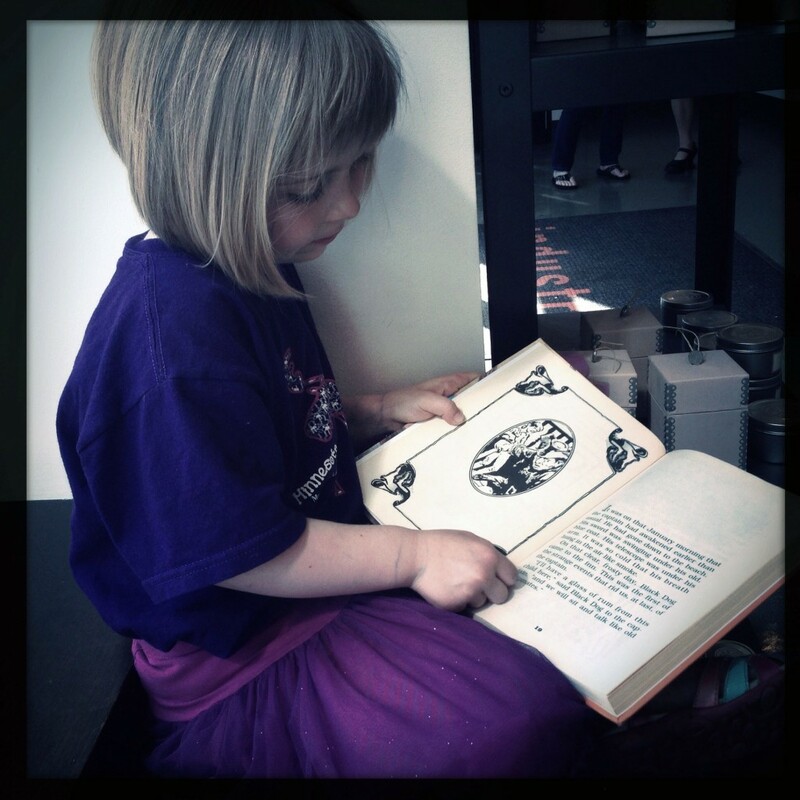 Should you read your child abridged versions of really good books? No! At least in the case of Treasure Island. Treasure Island was yet another classic book I missed as a kid, so I was pleasantly surprised to stumble across it in my early 30’s and think, wow, here is probably one of the most perfect adventure books ever created, complete with pirates, buried treasure, a big old ship, and beautifully bright writing. Despite the countless examples of hard drinking, violence, and, in general, bad pirate behavior – this is not one of those moralistic children books where people behave, or learn to behave, kindly toward each other — I was counting down the years before I could read it to my kids. So when, at a library used book sale, I stumbled across this abridged version of Treasure Island, part of the Treasury of Illustrated Classics series, I snatched it up, despite the horrifically crude pictures. My son read this version on his own last year and enjoyed it (he was 6 then), so I thought I would read it to my 4 year old recently. This was not a great idea for several reasons. First, even the abridged version could not exclude all the hard drinking, cruelty, murder, and violence of a pirate’s life. Though I was able to gloss over some of the rum references, it may not be 4 year old material, in my opinion. Which might be obvious. Secondly, the abridged version was awful. I imagined “abridged” as taking large chunks out but keeping the spirit and voice of the original (Treasure Island is, after all, first person, so voice counts for a lot). But this edition seems to be an entire rewriting. Worse, abridged, in this case, seems to mean rewriting while somehow managing to take out all of the brightness and beauty of the original, while underestimating, I think, a child’s ability to follow complex sentences. It’s a little like comparing one of the new translations of the Bible after drowning in the beauty of the King James’ version (which, by the way, I’ve been doing in the mornings as research for a new story, thanks to Bible Gateway). Though honestly the idea of any abridged book makes me queasy, as something essential must be lost in the process of shortening. Still, I found myself wondering, had I imagined the greatness of the original version? Is Treasure Island just another poorly written adventure novel? So I went back to the original to compare. It’s a great example of how important voice is and how two writers, one good (Robert Louis Stevenson) and one not so good (sorry Barbara Green) can take the same material and either make it work or ruin it. “I remember him as if it were yesterday, as he came plodding to the inn door, his sea-chest following behind him in a hand-barrow—a tall, strong, heavy, nut-brown man, his tarry pigtail falling over the shoulder of his soiled blue coat, his hands ragged and scarred, with black, broken nails, and the sabre cut across one cheek, a dirty, livid white. I remember him looking round the cover and whistling to himself as he did so, and then breaking out in that old sea-song that he sand so often afterwards: “Fifteen men on the dead man’s chest— Yo-ho-ho, and a bottle of rum!” in the high, old tottering voice that seemed to have been tuned and broken at the capstan bars. “And indeed bad as his clothes were and coarsely as he spoke, he had none of the appearance of a man who sailed before the mast, but seemed like a mate or skipper accustomed to be obeyed or to strike. The man who came with the barrow told us that the mail had set him down the morning before at the Royal George, that he had inquired what inns there were along the coast, and hearing ours well spoken of, I suppose, and described as lonely, had chosen it from the others for his place of residence. And that was all we could learn of our guest.